Chart based on 21 repairs. 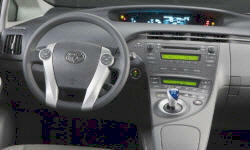 See TSBs and recalls for the 2013 Toyota Prius. Chart based on 18 repair trips. The repair cost chart excludes repairs made under warranty, do-it-yourself repairs, and repair trips that include maintenance. 45000 mi Drivers seat belt would not unlatch. The entire seat belt assembly was replaced. 6000 mi Making loud rattle noise/shake under hood on initial startup. Would go away after warmup. Toyota recommended having it towed to shop and sent tow truck. Dealer had car for 2 days. Has made same noise 1 time since. Replaced intake manifold. US $350 Brakes making noise when depressed. 5000 mi Entune bug caused Bluetooth/iPod to begin playing automatically when connecting a new device. Entune update fixed issue. 9000 mi Faulty caster bolt. Took 2 days because the recall. US $100 Key lock wouldn't work. 6000 mi Bluetooth for handsfree cell use failed, locked up phone and radio. 13000 mi Handsfree bluetooth not repairable. Software issue between Verizon & Motorola componets. Must repalce cellphone with different type. 50000 mi Dealer improperly secured shrouding around engine after oil change. Dragging heavily on the ground. Car had to be hauled back to dealership. 29000 mi Software update for the MG ECU & Power Management ECU. 20500 mi Moonroof rattled when in fully open position. Dealer replaced moonroof guide rail system. 40000 mi Recurrence of moonroof rattle when in open position (not tilt position). US $200 Auxiliary battery replaced by owner. See our lemon odds and nada odds page to see vehicles with no repairs or vehicles with more than three repairs. 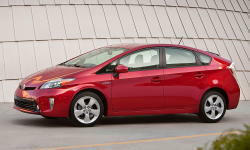 To see how frequently 2013 Toyota Prius problems occur, check out our car reliability stats.